Plastic 6 Pack Rings- baby duck death traps? Or a convenient tool in the conveying of beers? Let’s answer some simple questions. Yes. They keep our beers, and for children, sodas together. Because of them, I can easily carry up to 18 beers at once and I could probably, if I wanted to, push that number to 24 with a little more effort. Think about that- one man, easily carrying 24 beers. Could you imagine the struggle of having to keep 24 beers together WITHOUT the use of these things? It would be a ridiculous exercise in futility and a wonderful Mr. Bean sketch. Alas, there is another side to the story. Apparently, for some reason, ducks and turtles along with other animals in their ecosystem, appear to be unable to avoid getting their beaks, and bodies stuck in them. 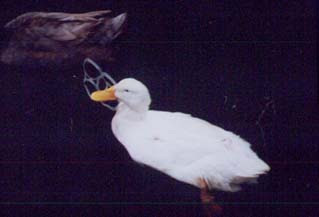 As a human, I’m sure I’m not alone in finding it difficult to understand how something that should so clearly be discarded- a used plastic 6 pack ring- would find its way around the neck of a duck or turtle time and time again. Further, after the 300th time this occurs, should we be sympathetic to these creatures? It’s not like we’re talking about a bear trap here. It's not like the 6 pack ring things strewn around the country are baited. Are they? No. After all, find me with a 6 pack thing around my neck once, shame on you. Find me with a 6 pack thing around my neck a hundred times more, shame on the duck. So what to do? 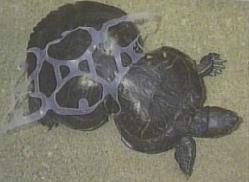 Many say an appropriate compromise is to destroy your plastic 6 pack ring things after you have used them. I suppose that’s doable. It’s certainly better than banning the rings but really shouldn’t ducks and turtles should learn not to get their beaks caught in them? I know as humans we’re better than ducks and turtles, so we’ll go the extra mile to cut the rings and make sure their retarded asses are safe from them, but really, wouldn’t the ducks and turtles who managed to avoid the 6 pack things be the smart ones? And wouldn’t it serve the duck and turtle species better to have these "smarter" members of their race mate? Just saying. This is one of the most horrifying and terrible things i have seen a person write. Your ignorance will be your downfall. I'd like to see a 6 pack ring around YOUR neck, too bad i actually "waste" 5 seconds cutting them. YOU obviously arent one of the "smarter" members of this race. Dude, the original writer of this blog died when he was choked by a 6 pack thing while swimming at the jersey shore. I work in a brewery and stamp those rings on beer cans, but i've never stamped them on turtles. Turtles wouldn't fit in the press.